The Dong ethnic group are renowned for their musical ability and their skill as carpenters. From the Kam Grand Choirs to the looming Drum Towers, Dong villages are a place of harmony and wonder. The Dong people boast a population of nearly 3 million in China and the vast majority of them are concentrated in eastern Guizhou, western Hunan and northern Guangxi. Legends abound as to how the Dong people came to settle where they are now. Although all Dong people agree that their ancestors migrated from the east, southern Dong people believe their ancestors came from Guangdong and Guangxi, whilst northern Dong people believe their ancestors were forced to flee from Zhejiang and Fujian due to locust swarms. 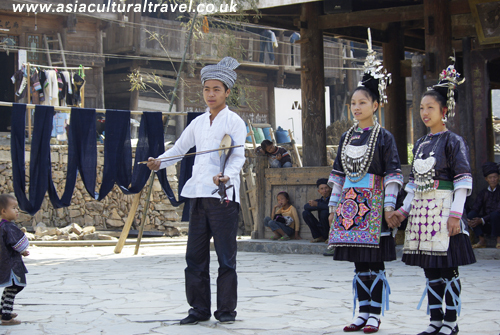 Their culture stretches back hundreds of years and this is evident in their daily life and local festivals. The average Dong village consists of about 200 to 300 households, although the smallest ones will have only 10 to 20 and the largest can have upwards of 1,000. Villages are traditionally led by a council of elders, who are usually over the age of 60 and who utilise the village Drum Tower to hold meetings and discuss local affairs. There are certain features that are common throughout all Dong villages and these include wooden houses supported by stilts, Wind-Rain bridges, Drum Towers, sacred ancient trees, bullfighting arenas, wells surrounded by stone rims, communal fish-ponds, village gates, and altars to the deity Sa Sui. The Dong language, known as Kam or Gam, is as complex as their culture. Kam is a tonal language but unlike Chinese, which has only 4 tones, there are a staggering 9 tones in Kam that are all used to denote meaning. Officially no written form of Kam exists, although there is now a Latin Romanisation of their language. The history, folktales and legends of the Dong people have all been passed down through song as part of their oral tradition.